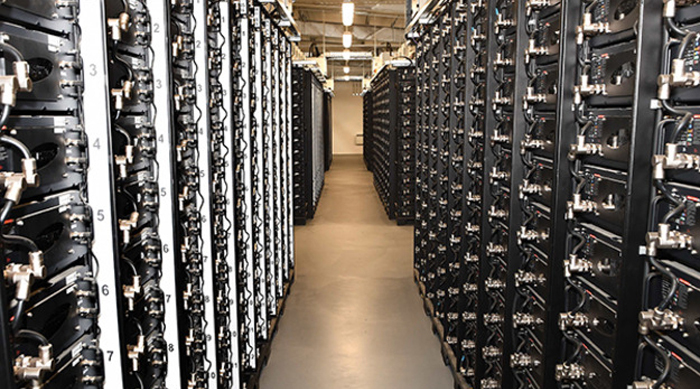 The frequency response market is approaching saturation due to the rapidly growing pipeline of battery storage developments, industry figures have warned. Over the next few years it will become increasingly difficult for battery developers to secure investment on the basis of frequency response contracts, they told the audience at an event in London. “From a fairly modest starting point – about 100MW – we could well see something like 3GW to 3.5GW of capacity coming through in the coming years, given what’s already in the pipeline,” said Aurora Energy Research director Ben Irons. National Grid’s requirement for FFR currently stands at around 600MW and is expected to rise to more than a gigawatt by 2030. Irons said there is “clearly a magnitude order of difference between the number of projects coming forward and the size of that particular market. Battery developers will instead need to build their business models around arbitrage – buying electricity when prices are low and then reselling it when prices rise. But Irons cautioned that this will come with some significant challenges. He said operating batteries in a merchant environment is extremely complicated, even more so than for conventional generation: “There are more dimensions at play. You’ve got a very complex marginal cost concept; you’ve got degradation [which is] hard to predict and a function of a number of different things. “You’ve also got a limited amount of battery capacity power that you can sell on the market. You can’t simply wait until the price is high enough and then run it until the price is too low like you can with a thermal plant. He said these operational difficulties will also make it hard to secure low-cost financing. Nevertheless, Irons argued that the case for investing in batteries on the basis of arbitrage is already beginning to look good. “We think the types of returns that the market currently offers are in the order of 10 to 12 per cent,” he informed delegates. “So that’s getting very close to the level where a merchant investment starts to feel attractive. Aurora’s forecasts indicate that between 4GW and 10GW of battery capacity could be operating under the arbitrage model by 2030. Irons said the balancing market will be very profitable due to the much higher levels of price volatility it exhibits when compared to the wholesale market, regularly seeing negative prices. He predicted that batteries will come to account for the majority of spending in the balancing mechanism: “We think the nature of batteries – the flexibility, the fast-response times, the fact they can ramp up or down – gives them an inherent advantage. That economic advantage will translate into volume”. Irons made the comments at a conference on flexibility and storage hosted by Aurora. Appearing on a panel later in the event, Anesco business development director Chris Miles agreed that it is “imperative” for storage developers to start looking at opportunities for arbitrage, as the frequency response market will be “pretty full” by the end of next year. Miles welcomed Ofgem’s plans to prevent storage from being charged final consumption levies and redesign the balancing mechanism to introduce greater price volatility, saying the reforms need to come “as quickly as possible”. He said if batteries are to make in-roads into the wholesale and balancing markets, degradation and financing costs will also need to be lowered. Erik Nygard, chief executive and co-founder of smart energy firm Limejump, said achieving this will require more operational experience as storage is “fundamentally different” to other types of assets such as thermal generation and renewables. “It’s a learning exercise,” said Nygard. “Real life conditions are just different. Weather will have an impact. Your internal cooling systems will have an impact”. Santander director of renewable energy Mark Cumbo said the lack of historical data currently presents a major barrier to investment. “This is a market where you can’t look back at the last 12 months, 24 months of operations to form a view about what’s going to happen in the future because it isn’t there,” he said.